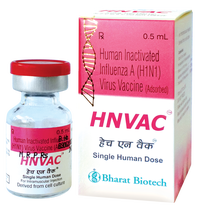 A human inactivated Influenza A (H1N1) 2009 vaccine, HNVAC® is prepared using the pandemic influenza strain obtained from WHO-accredited Centers for Disease Control and Prevention, USA. HNVAC® is a cell culture derived vaccine, produced using Madin-Darby Canine Kidney (MDCK) cells. It is an inactivated and chromatographically purified vaccine.